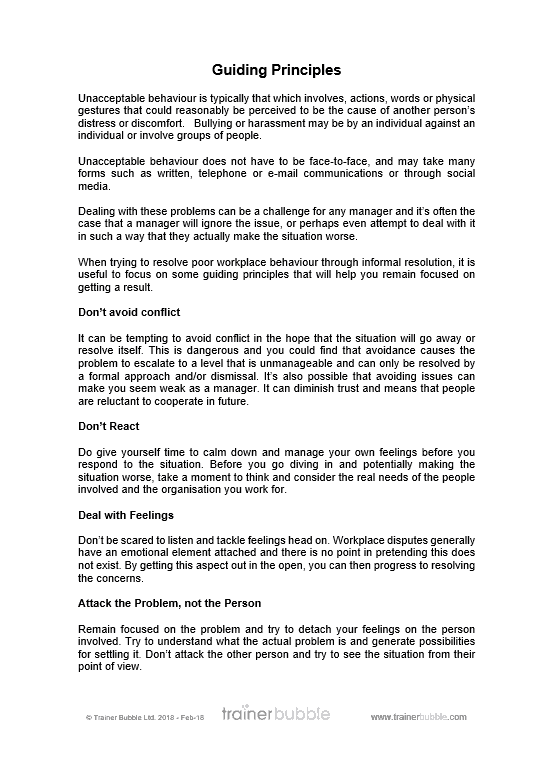 When used effectively, informal resolution is a useful process to help nip poor performance or behavioural issues in the bud, before they become insurmountable and end in disciplinary procedures and potential removal from the workplace. Many cases need to follow a formal process but other issues are allowed to develop into more serious situations where an early intervention would have prevented it from escalating. If you are able to prevent an issue from escalating to a formal case, the benefits are numerous, not least in terms of financial savings and time spent on investigation. You will also benefit from a workforce who are happy to work in a safe environment and are confident that any such issues are dealt with promptly. In this training course, we aim to give your participants an understanding of how informal resolution works and the tools to implement the process effectively. 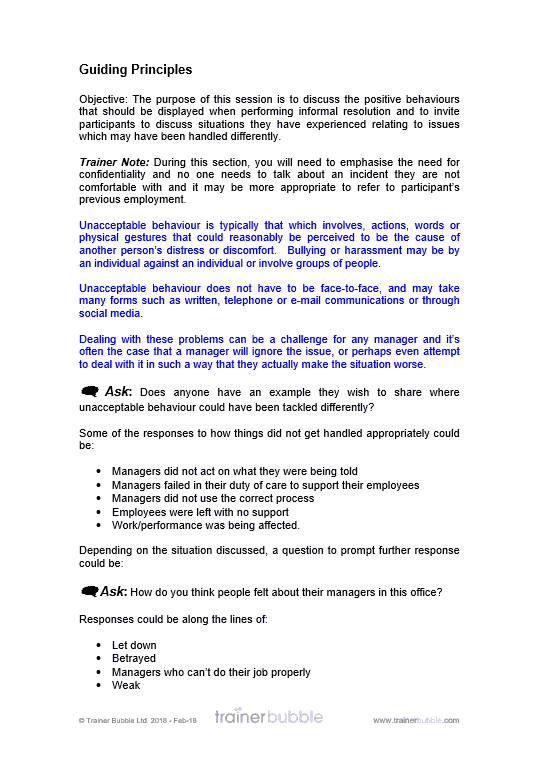 Therefore, these Informal Resolution training course materials are suitable for anyone that manages or leads a team. 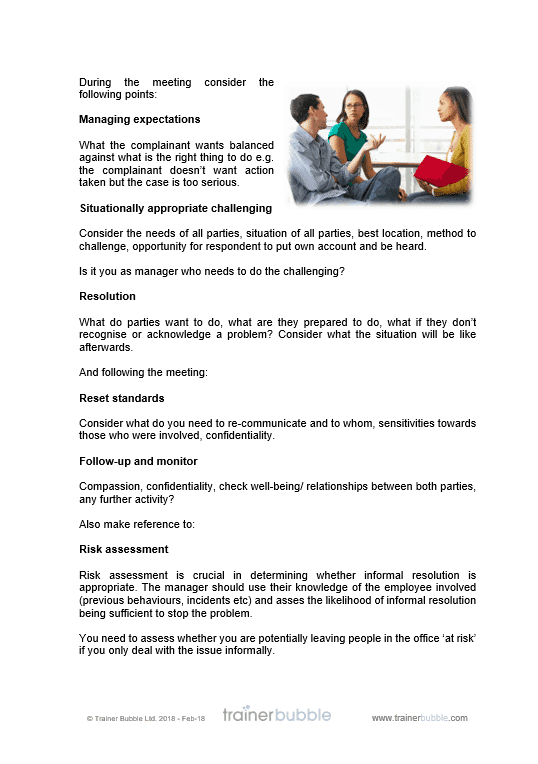 Informal resolution is the process of a leader or manager having an informal discussion with an employee in order to informally resolve a performance issue before it evolves into something more serious. It comes from the principle that performance issues are most effectively resolved as early as possible. The process generally involves a manager discussing an issue with the individual or people concerned, looking for a mutually agreeable solution that will ensure the negative performance issues are reduced or removed in future. Sometimes informal resolution is used to begin more formal procedures and is seen as a way of setting an outline of the required behaviours of the individual. These training course materials aim to give your participants the confidence to address issues informally and the skills to do it effectively. 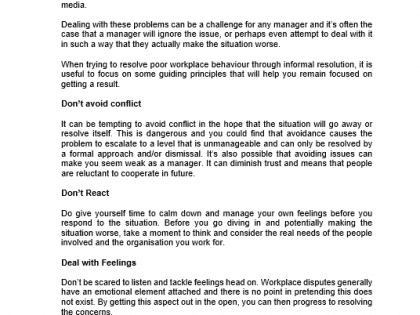 Perhaps you’re looking to ensure your managers are better able to solve problems before they escalate. Or you want to include informal resolution skills training as part of management and supervisor development. Whatever your need, Trainer Bubble provides you with a comprehensive informal resolution training course to make your life easy. Why is running this informal resolution course a good idea? Understand the benefits of informal resolution and the impact it can have on performance issues. Explore what informal resolution is and how it works. 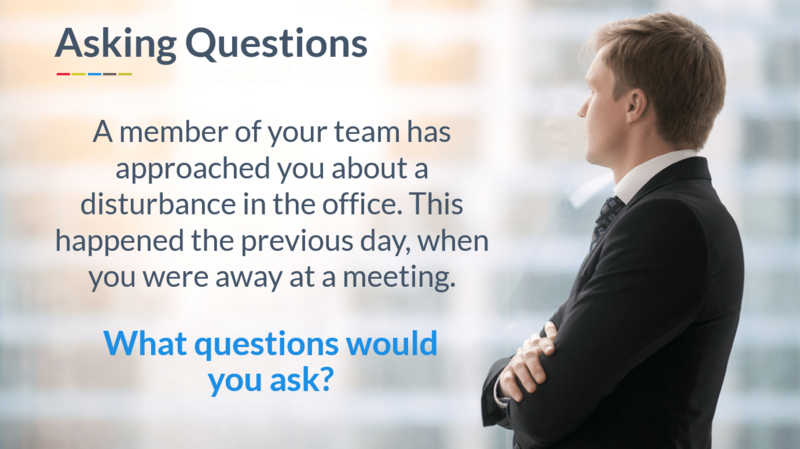 Develop the skills required to manage informal discussions and get results. Structure questions that get the most out of informal discussions and help focus on positive outcomes. 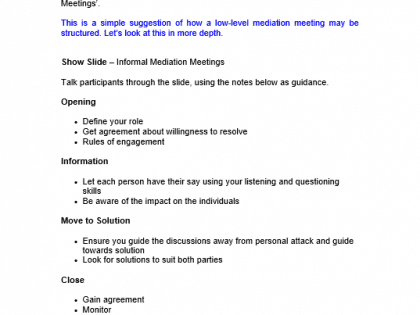 Hold mediation meetings that will move concerns to solutions. 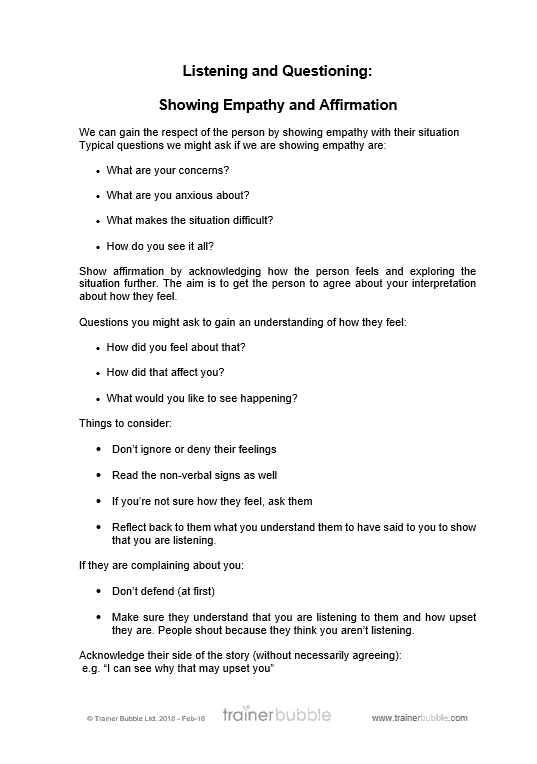 Respond to resistance and the barriers that people put up during discussions. Follow a selection of guiding principles that help focus on positive resolution. Ultimately these training course materials allow you to provide your participants with the knowledge and skills to effectively resolve behavioural situations before they escalate. Your participants will benefit from using the methods and models included in these training course materials. They will help the to understand informal resolution and instigate changes for the long term benefit of your organisation. The training content will also help define informal resolution and ensure participants are able to understand how to adopt an informal approach where appropriate. Welcome, Introductions and Scene Setting – An introduction to the subject, an opportunity to review the course objectives and identify any personal objectives of the group. Understanding Bulling and Harassment – This session underlines the participants understanding of bullying and harassment and how informal resolution compares to the formal process in these instances. Informal Resolution Investigated – In this activity based session, participants are asked to consider what opportunities exist for solving matters informally, what skills are needed and what situations are appropriate for informal resolution. Skills and Behaviours – In this session activities are used to emphasise the appropriate skills and behaviours necessary to resolve issues informally and guidance is provided on personal improvements. 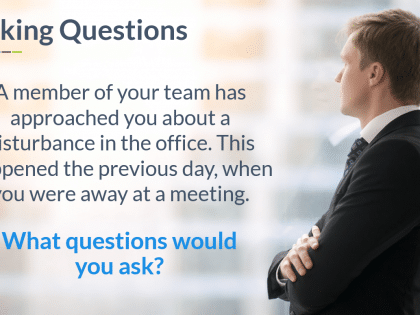 Asking Questions – Encouraging the participants to use probing questions when confronted with a potentially volatile situation. 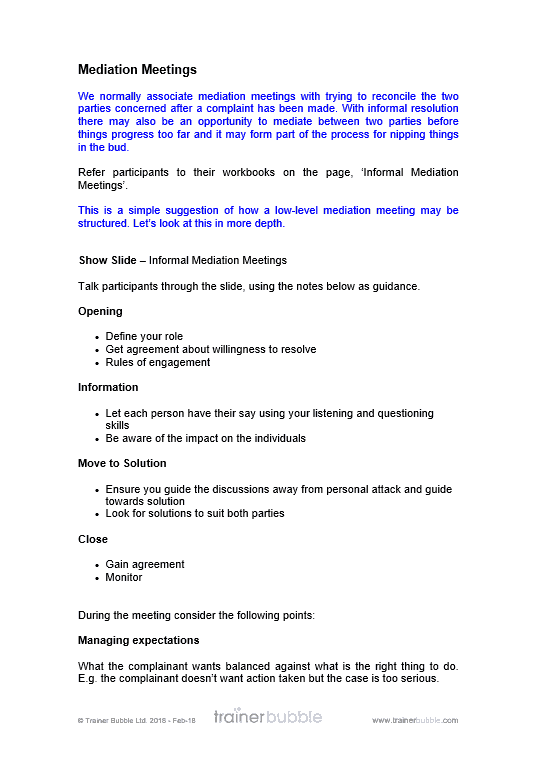 Mediation Meetings – A discussion based session on the structure of informal mediation meetings with a clear plan for success. 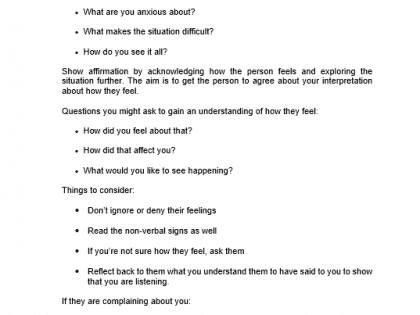 Responding to Resistance – Using typical statements participants are asked to develop responses to where staff may be reluctant to pursue an informal approach. Barriers to Informal Resolution – This session investigates what prevents some managers from pursuing an informal resolution and includes a ‘challenging friends’ scenario that provides a case study to review ideas. Guiding Principles – Participants review and discuss the positive behaviours that should be displayed when performing informal resolution. They are also invited to discuss situations they have experienced, which may have been handled differently and what could have been done. Bystander Apathy – Using an extreme real life example, this session examines why we sometimes fail to act. Practice Sessions – Here we have an opportunity to put the learning into practice and for participants to receive feedback using realistic scenarios. What Will I Do? 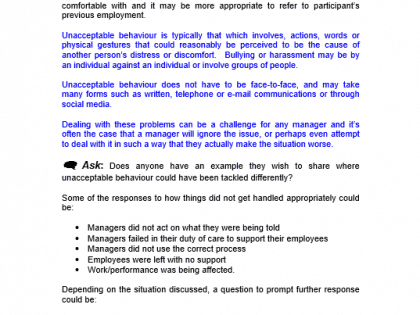 – Participants are asked to plan what changes to their behaviour and approach they will make as a result of attending the course and are referred to their action plans.